Because the quads were born nine weeks early we took extreme precautions their first year of life to protect them from potentially fatal germs. It was difficult being homebound most of the time, but we do not regret that time since we did not have a single sick visit to the pediatrician until 13 months. It’s been a year since we lifted our “lock down” restrictions and have been on a mission to explore the greater Dallas Fort Worth Metro area ever since. 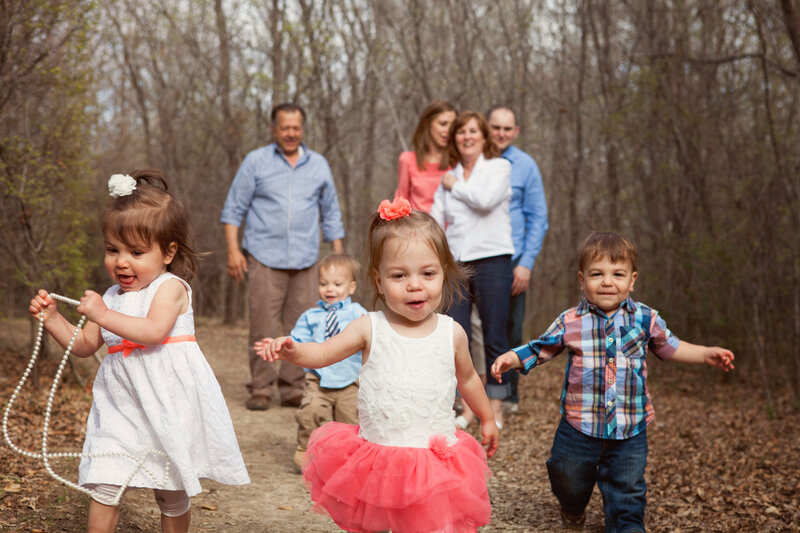 It’s always a challenge getting out and about with four toddlers, but a worthwhile mission. With each new adventure the quads learn just a bit more about the world around them. 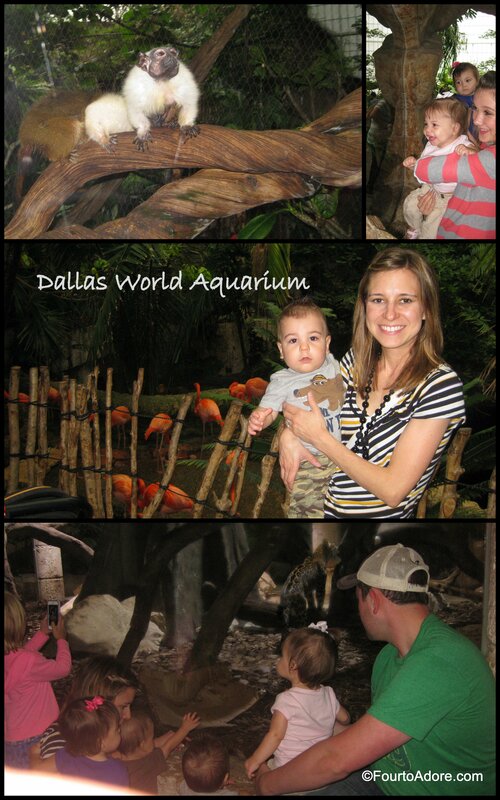 Arrive early and go on a weekday if possible as the aquarium becomes crowded easily. Look for coupons. We were able to get $4 off each adult ticket with a single coupon. Pack a picnic lunch to enjoy in the food court of the mall, or grab lunch in the food court. 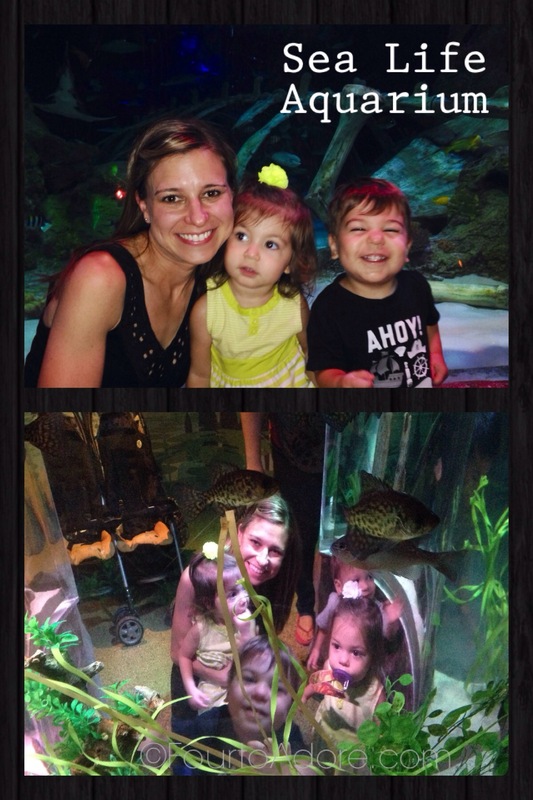 After you buy aquarium tickets you are allowed reentry during the same day. 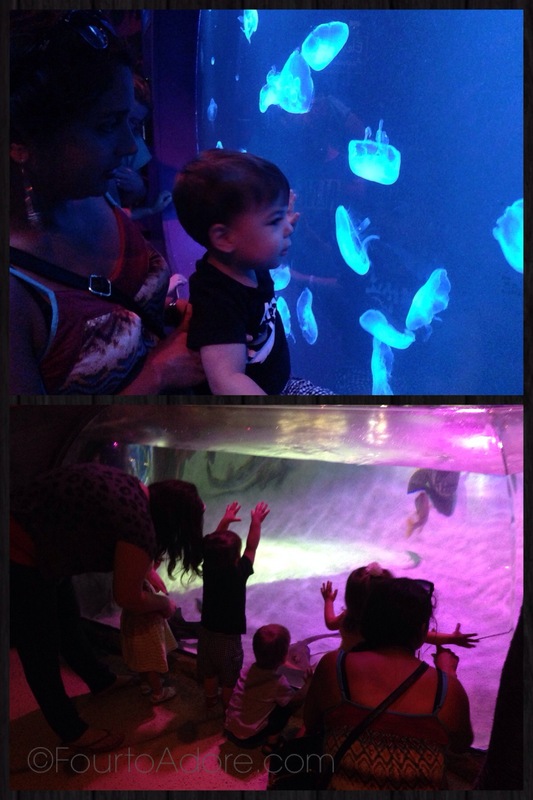 The aquarium is stroller friendly so bring one along if you have young toddlers who may tire easily. If you may go frequently, consider buying a punch card ($40 for ten punches). It can be used with multiple children and will save you money over time. All children must have a signed waiver to play. You can sign it online ahead of time to save you time in the center. You can bring your own food and drinks so pack a picnic or snacks to enjoy. Shoes aren’t allowed in the bounce house area so skid proof socks are a great way to keep your little one’s feet clean. 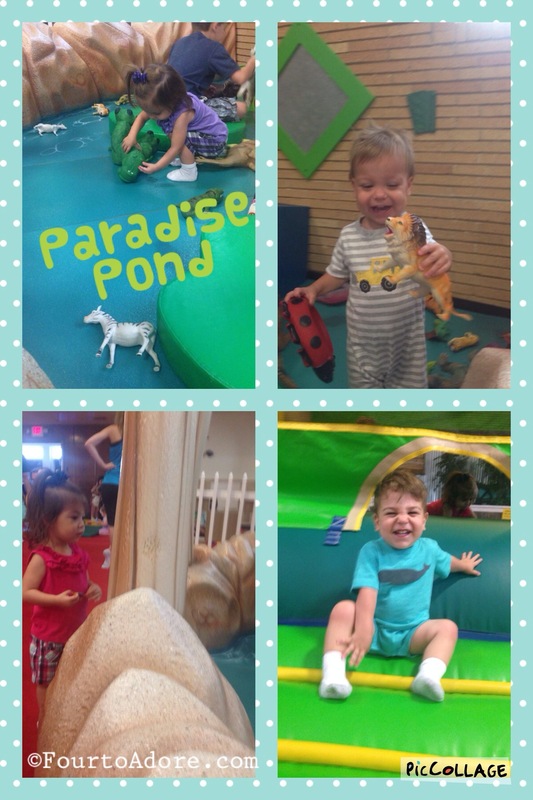 Arrive early to avoid crowds and go during the weekday free play times. If you have a child who receives ECI services, ask your case manager about their monthly play dates. Admission is discounted for ECI families during the play date. 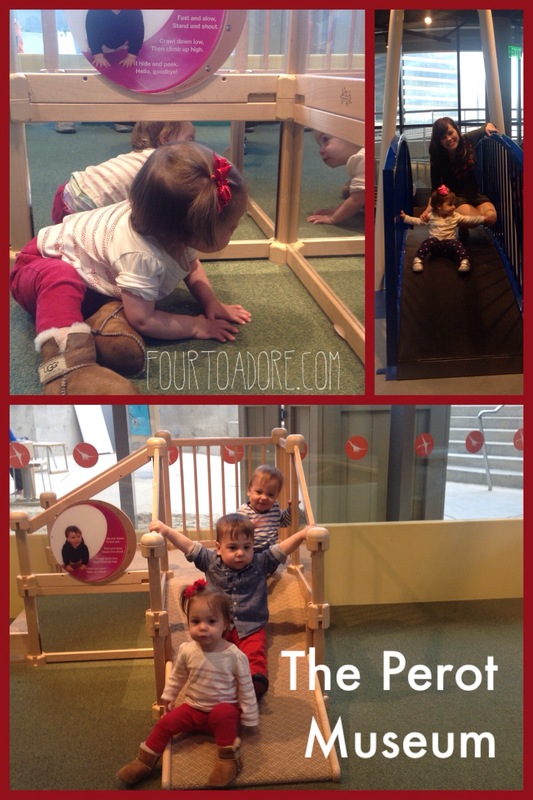 The children’s museum located on the first floor was most appreciated by the quads. They splashed in the water table and loved the side area. Purchase your tickets online ahead of time. Your ticket is valid for the entire day after your reservation time, so choose an early time even if you are going later. (e.g. if you choose 12:00 pm, you will not be allowed entry until 12:00 pm or later. So don’t expect to enter even at 11:59 am). The Perot has elevators, but they tend to become extremely crowded at there is a long wait time. Therefore it is not ideal for strollers. I do not plan to bring the quads back until they can manage walking distances and do not need strollers. No outside food or drink is allowed in the museum area, but there is a lovely concrete park with splash pad that would be great for a picnic. With your ticket, re entry is permitted during the same day. Therefore, you could leave the museum for a picnic lunch and return later in the day. Check to make sure the museum is not closed for a private event. It was closed the original date we planned to visit. There are multiple locations, check for your nearest location. Technically, entry is free. In order to play games, you’ll need to purchase tokens, and you may choose to order food from the menu. Complimentary bibs are provided so no need to pack one (or more) in your diaper bag. 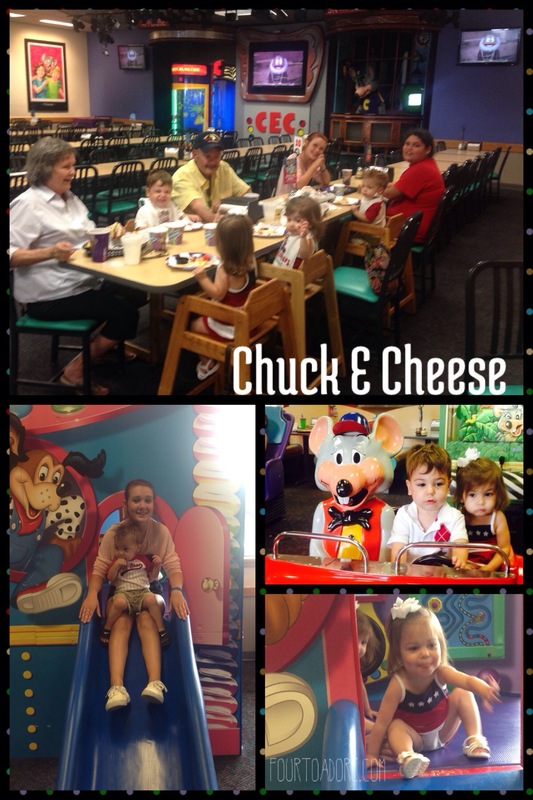 Remember, you don’t have to buy a meal to play at Chuck E. Cheese. I’d suggest going when it’s not a mealtime, and either order a small snack to enjoy or eat prior to arrival. Going when it’s not a mealtime means it’ll be less crowded and you will likely spend less money on food. You can buy tokens and enjoy the games and play area even if you don’t buy food. If you sign up for the Chuck E. Club, you’ll receive discounts, and a calendar with 10 free tokens. It’s located close to the Sea Life Aquarium and Rainforest Cafe so you can stop by if you are already visiting Grapevine Mills. 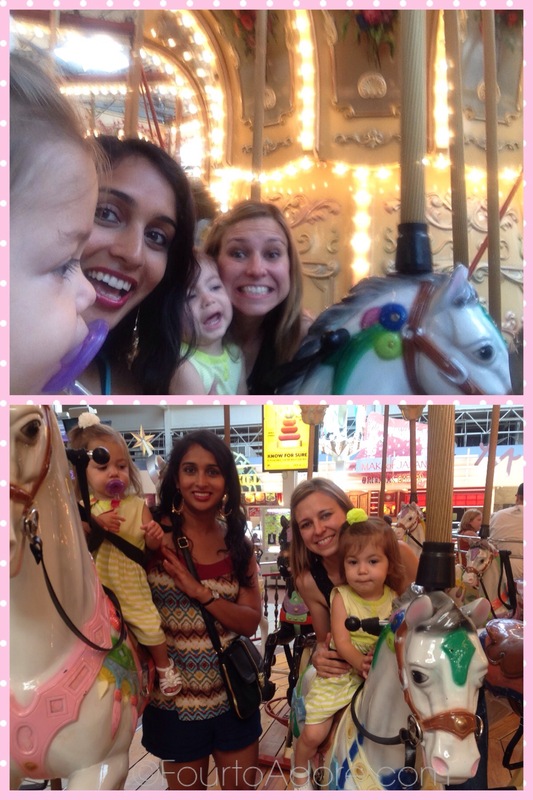 If you have multiple children or plan to visit often, don’t forget to get a frequent rider punch card. Your 11th ride is free. 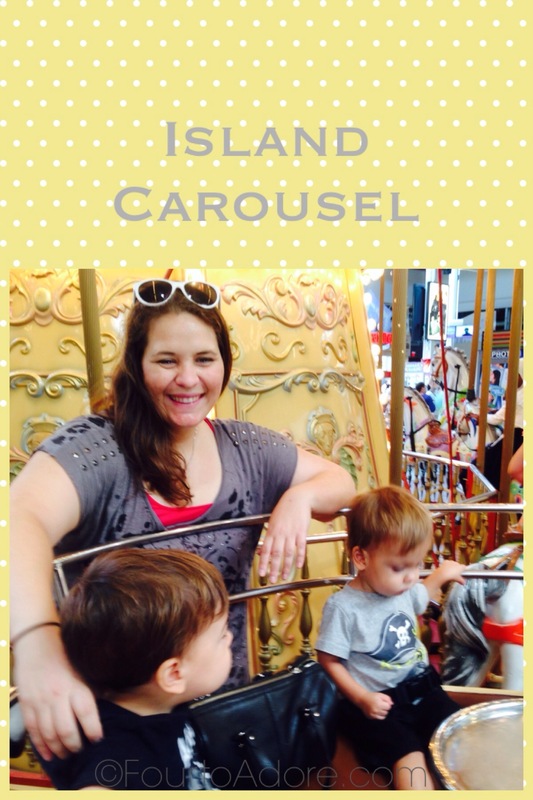 If your child has never ridden a carousel, you may want to choose a stationary horse or sleigh seat. Play areas are sectioned off by picket fences, which makes keeping an eye on babies and toddlers easy. They have a limit to the number of guests per day so it doesn’t get too crowded. Shoes are not allowed in the play area, and socks are required. They have loaner socks available, but you’ll want to pack your own. If you feel generous, and want to support the ministry, I suspect they’d appreciate new packages of white socks, especially in toddler sizes. The area is designated for ages 2 to 6th grade. There are plenty of areas for smaller babies to play with close supervision. Older children, especially pre teens would not likely find this play area entertaining. There is a required Liability Release Form that can be printed and completed at home. Girls wearing dresses are not allowed in the jungle gym or bounce house, so dress your children accordingly. If possible, visit on a Wednesday when admission is half price. Check for coupons, local employers often have access to discounted tickets as well. 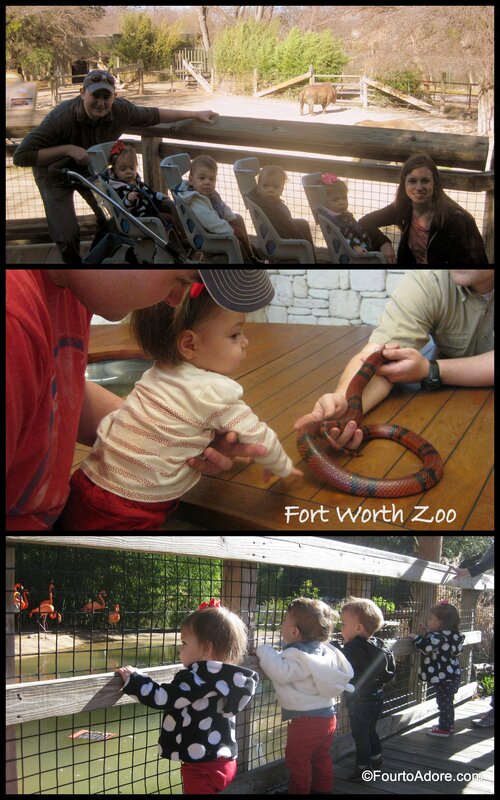 The zoo is stroller friendly so be sure to bring one if you have little ones who will tire from lots of walking. The majority of the facility is indoors and climate controlled so it’s a great place to visit if it’s rainy, too hot, or cold. Despite being an “aquarium”, a significant portion of the facility is made of rainforest creatures. The quads most appreciated the monkeys. The Lego miniature of Dallas-Fort Worth was by far our favorite attraction. Look for coupons, especially if you are also interested in visiting the Sea Life Aquarium. There are often discounts if you buy tickets together. If you don’t score a coupon, you can save money by booking tickets online the day before. There is no reentry and outside food and drinks are not permitted so plan accordingly. Allow about 2-3 hours for your visit. 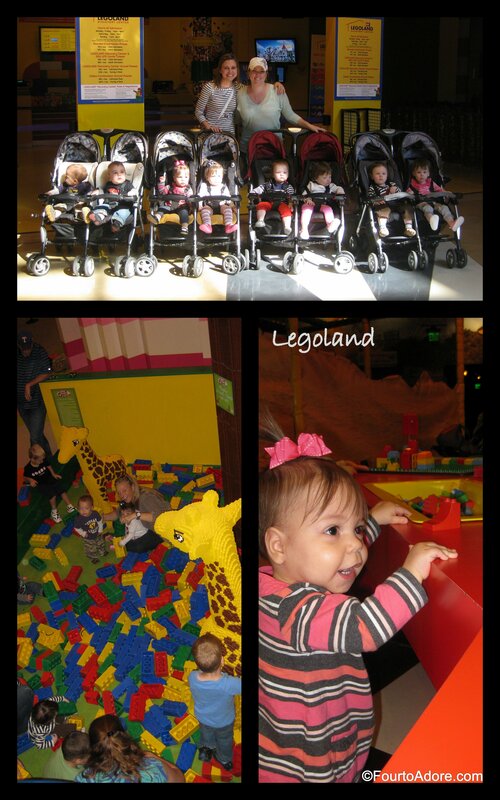 While babies and toddlers are welcome to play, Legoland would likely be most appreciated by children over three. 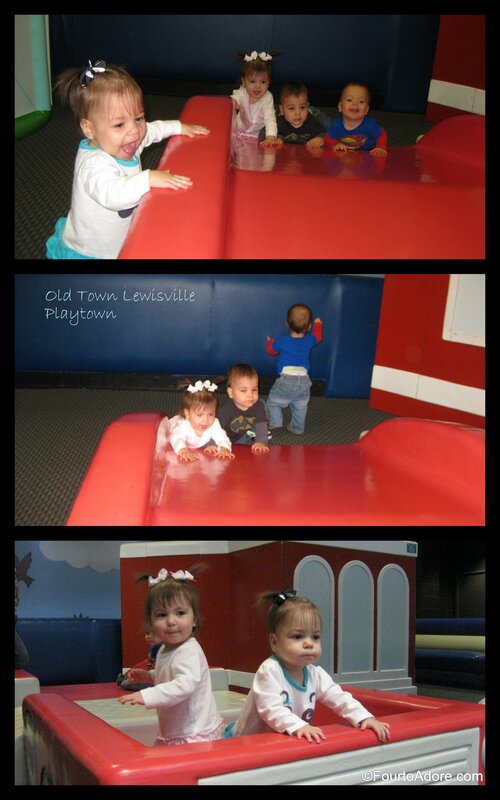 The entire play area is soft sided, which is ideal for new walkers, and even crawling babies. Everything is toddler sized and not too tall for younger babies. Visit early in the day, or after the 3:00 pm cleaning so the area is fresh. 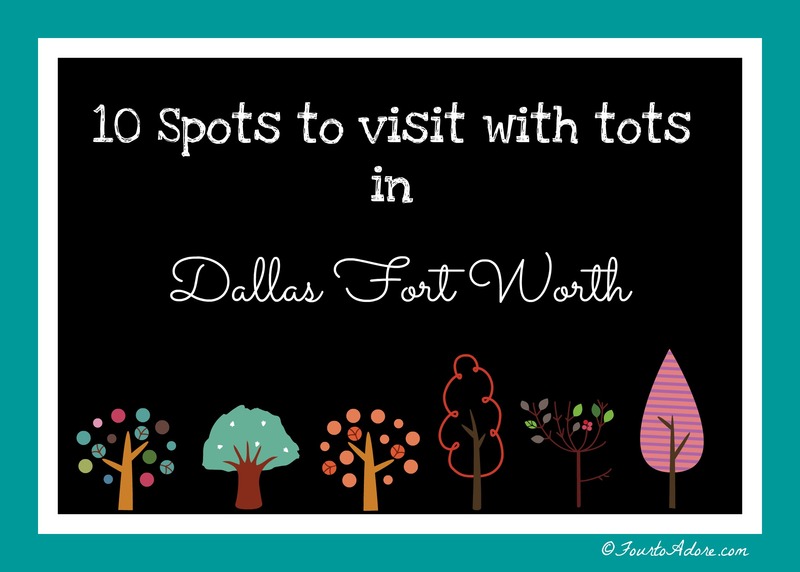 There are so many more places on my list….The Dallas Arboretum….The Botanical Gardens….The Dallas Zoo….AND at some point we plan to travel outside of our metro area for a legit vacation. I’d like to wait until the quads are potty trained and sleeping in beds before we take that plunge. What’s the best place to visit in your hometown? My best friend just moved to Dallas, TX with a toddler. She’s a single mom and I’m going to be sending this post to her! I was down in Dallas helping her move but saw this late! Ah! I wish I had finished before your trip. It took me forever. I hope your BFF feels welcome here. We try to be friendly with southern hospitality down here!